Dearest art aficionados, for those of you who, much like myself, associate the autumn season with new literary ventures, art cravings, coffee shops and intellectual teasing of all sorts, make sure to book your evening off Oct. 22 for Cinema Politica’s upcoming screening of The Heretics. 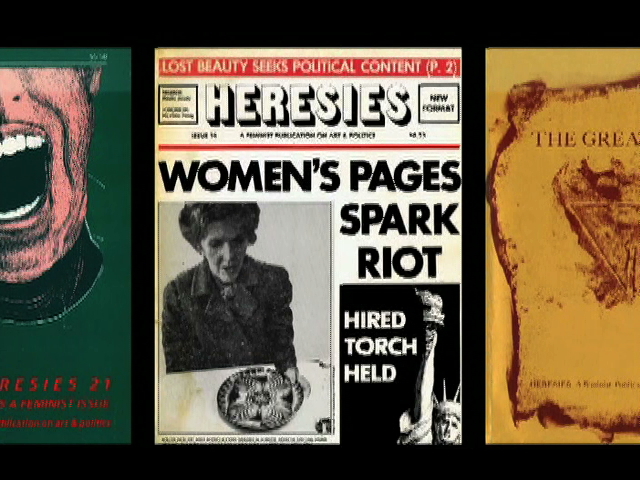 The film, which was written, directed and produced by Joan Braderman in 2009, explores the complications of feminism, art and media in the 1970s, through interviews with members of the feminist art magazine, The Heresies. Artists who were once a part of the editorial crew contribute their views, memories, and nostalgia, recalling poignantly some of the more controversial moments of the magazine that ran for 27 issues, from 1977 to 1992. Most of these women are what would be considered “second-wave feminists,” although many of them are quick to state that they no longer like to be associated with the feminist movement, because it has taken on a subversive meaning. “It used to be that being a feminist meant that you were a fighter. Today, it means you’re a victim,” states one of the interviewed artists, with more than a hint of dismay. The documentary makes it its mission to point out the uniqueness of The Heresies. As Braderman explains it, in an era where the art world was ruled by panels of men, this magazine, which was owned by no one in particular, funded without any form of advertisement and relied solely on its subscribers, was a peculiar phenomenon. Contributors vividly recall the many meetings a week they attended; drinking, smoking and arguing into the early hours of the morning, debating the controversy that they had managed to stir up amongst their readers. It’s true that the film is fairly one sided, though this does not make it exaggerated, a fault that is often attributed to documentaries of the sort. The ‘collage’ style of Braderman’s documentary was lackluster at times, but her interviewees entirely made up for it. Instead of blatant condescension and old-days nostalgia, the film presents a fabulous crowd of alert revolutionaries who decided that if no one was going to change the world for them, they would simply have to do it for themselves. Expect a documentary that does a marvelous job at telling the story of friendship, companionship and controversy, reminding our generation of what it truly means to blur the lines between who we are and the art we live for. The Heretics screens at 7 p.m., Oct 22 at 1455 de Maisonneuve West, Room H-110. Ask yourself, would you risk it?